Defend the castle and wait for reinforcements! Jestro and his army of Lava monsters are making a final push against the King’s Castle—but they weren’t expecting this! Tech whizz-kid Robin Underwood has built a mighty robotic suit of armor for King Halbert to defend the people of Knighton. Swing the giant sword or launch the flying shield with trusty King’s bot at the controls. Includes 2 scannable shields for NEXO Powers Storm Dragon and Backfire. 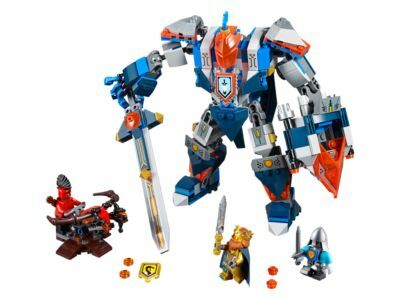 The The King's Mech (70327) Lego set is no longer directly available from the sites below. However, 3rd party partners of these sites might still have the set available. Alternate description Help King Halbert defend the castle against Flamethrower’s crossbow stud shooter with the futuristic King’s Mech with detachable flying shield. Includes 3 minifigures.